THE annual KickstART workshop shows that Mzansi’s need for art and creativity is strong. 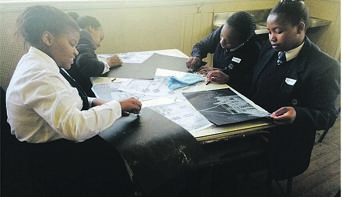 The initiative, which takes place close to the end of the year, invites hundreds of pupils from different high schools in and around the Stellenbosch area, in the Western Cape, to take part in art-related workshops sponsored by Deloitte. Developed by Stellenbosch Outdoor Sculpture Trust, the art project aims to show grade 9 pupils to follow careers in art and offer them a chance at winning a bursary. More than six high schools took part in this year’s programme which was held at Stellenbosch University Museum. The schools were selected as art is not a subject offered at the schools the pupils attend. The pupils painted, sculpted, took photographs and drew pictures of important people and events to express their feelings and opinions – and a panel of judges chose the winners. Andi Norton, project manager and founder of KickstART, said the workshop has been running since 2012. “Many pupils are not aware about careers in art. This is why the workshop was started. “We have had 13 winners since the programme started. “There is a problem with pupils at grade 10. Many pupils do not take maths and science to matric. But there is a stigma that finishing school without maths or science is a waste of time as you won’t be able to go out and get a ‘real’ job.